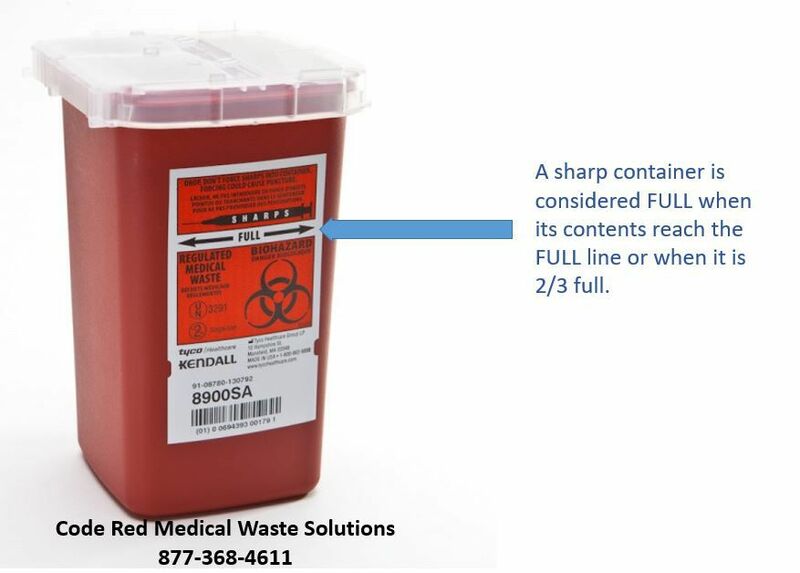 Sharp Containers Safety - Code Red Medical Waste Solutions, LLC. Managing medical waste could present many challenges to organizations of any size but it is especially challenging for small generators that can’t afford to have a specialized expert in the payroll. One area that is greatly misunderstood relates to sharp containers. I often get calls from current and potential clients looking for guidance on sharp management. Usually these calls are about disposal compliance but when I visit their facilities it becomes obvious that a deeper conversation needs to take place and the conversation should start with sharp containers. Sharp containers are regulated by the FDA and are classified as class II medical devices. FDA regulations require that sharp containers are made of “rigid plastic and come marked with a line that indicates when the container should be considered full” (fda.gov, 2013). This line is 3/4 of the containers capacity. You can find the line either on the container’s label or on the container itself. One reason I have heard from doctors that allow or overlook overfilling of sharp containers is the expense associated with the containers. Contrary to some beliefs containers found in the marketplace are not reusable. Nor are they meant to be opened and emptied out in a larger container. The practice of emptying the contents of smaller containers is illegal and it exposes the person engage in the activity of emptying containers to harm and injury. The issue of cost is one of perspective when you consider that the initial violation for sharp containers is around $540. If the violation is found to be related to poor or no training the fees in that category start around $800. If that is not incentive enough to get things in order just think of how OSHA will want to consider other matters pertaining to safety in your organization. Sharps should not be managed within the context of expenditures but in ensuring the safety of all people that have the potential of coming in contact with bloodborne pathogens.